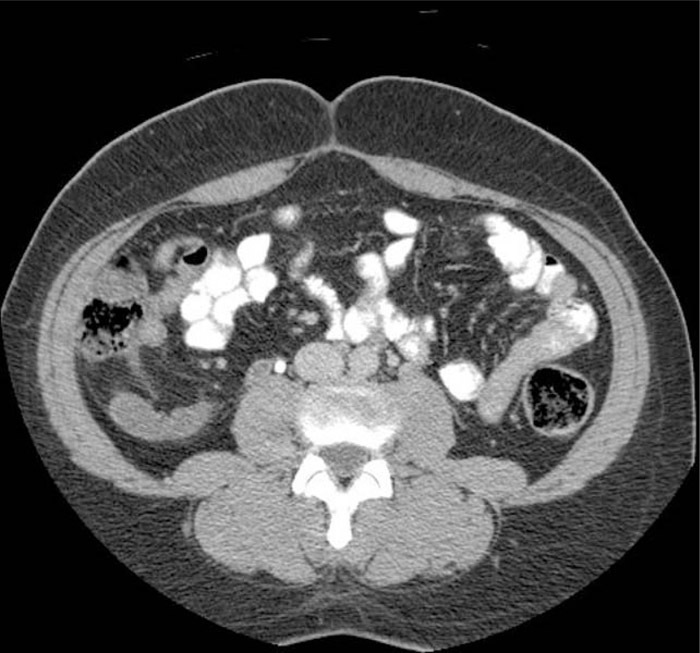 A 32‐year‐old African American woman presented to the emergency room (ER) with a 1‐week chief complaint of right lower‐quadrant abdominal pain that was sharp in nature and exacerbated by movement. There was no radiation and no association with nausea, vomiting, fevers, chills, vaginal discharge, or urinary complaints. She denied any recent pregnancies, use of oral contraceptives, instrumentation, pelvic surgeries, or travel. Past history revealed no family history of thrombosis. She previously had 6 pregnancies and deliveries that were uneventful. There was no history of any postpartum thrombosis or ever having been on anticoagulants at anytime. On physical examination, vital signs were normal; she was in slight distress because of pain. Her abdominal examination was remarkable for tenderness with and without palpation in the right lower quadrant, with no rebound tenderness or guarding. Flank pain could be elicited by palpation of the right lower quadrant and movement of the patient. Initial laboratory studies in the ER were normal. Because the etiology of the patient's pain was unknown, a computed tomography (CT) of the abdomen and pelvis with oral and intravenous contrast was ordered, which showed the right uterine vein was prominent with internal hypodensity along its course on both arterial and delayed images, which is consistent with right ovarian vein thrombosis. The remainder of the CT abdomen and pelvis was negative, with no enlarged lymph nodes or suspicious masses visualized. She was treated with unfractionated heparin and warfarin. Hypercoaguable laboratory evaluation including antithrombin III, proteins C and S, factor V Leiden, prothrombin gene mutation, and ho‐mocysteine level were all negative. Thrombosis of the ovarian vein is rare, but this condition can lead to serious complications, including sepsis, pulmonary embolism, and even death. However, it can respond favorably to anticoagulant therapy if discovered early enough in clinical presentation. This problem most often occurs in the postpartum period; however, it can also arise in inflammatory disease, after abortion, in association with preterm or cesarean deliveries, after hysterectomy and salpingo‐oophorectomy, or in the setting of gynecologic malignancy. There are only a few reports of idiopathic ovarian vein thrombosis in the medical literature. This unusual diagnosis is of some significance to hospitalists who often act as perioperative consultants for obstetrics and gynecology. Ovarian vein thrombosis, although a rare and unusual diagnosis, should be considered in unexplained abdominal pain in females, as early detection and treatment can lead to positive outcomes. Akhras E, Jeffries J, Rockoff S, Morrison J, Lala M. Idiopathic Ovarian Vein Thrombosis. Abstract published at Hospital Medicine 2011, May 10-13, Dallas, Texas. Abstract 225. Journal of Hospital Medicine. 2011; 6 (suppl 2). https://www.shmabstracts.com/abstract/idiopathic-ovarian-vein-thrombosis/. Accessed April 26, 2019.